WTA players Melanie Oudin and Julia Boserup are in town this week for the Western & Southern Financial Group Women’s Open being held in Mason. 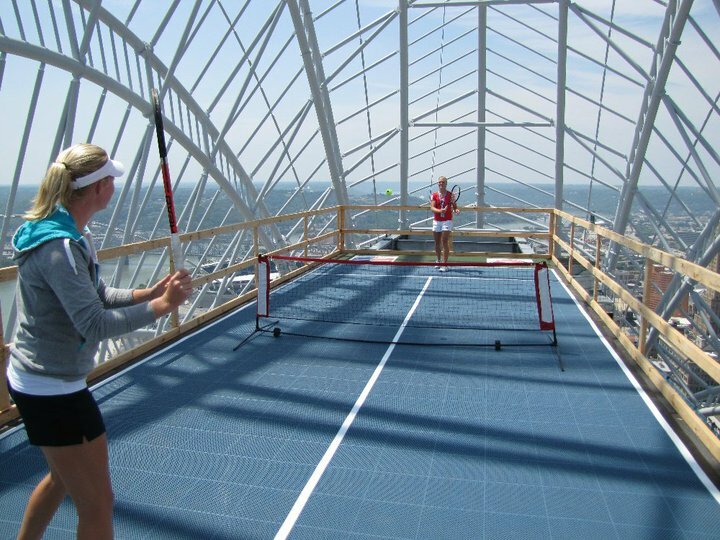 Before the tournament got underway, the two engaged in a friendly tennis match atop Cincinnati’s newest skyscraper 630 feet above the street. The Western & Southern Financial Group Women’s Open has grown in prestige recently and was upgraded to a “Premier 5” Women’s Tennis Association event joining tournaments in Dubai, Rome, Toronto/Montreal, and Tokyo. In 2011, the women’s tournament will merge with the long-standing Western & Southern Financial Group Masters men’s draw in an eight-day event. The combined tournaments will make the new Western & Southern Financial Group Masters & Women’s Open one of the top ten tournaments in the world, and the largest summer tennis tournament in the United States outside of the U.S. Open grand slam event. The back-to-back 2010 tournaments currently taking place in Cincinnati are the first to take advantage of a new $10 million facility upgrade that includes an additional 890 stadium seats, six new luxury suites, major media facility upgrades, and player amenity improvements within the new 52,000 square-foot West Building. With the upgrades, the stadium’s 11,500 seat capacity makes it the 22nd largest tennis stadium in the world, and the seventh largest in the United States. The Great American Insurance Tower at Queen City Square is expected to be complete in spring 2011 and will become Cincinnati’s tallest building eclipsing the historic Carew Tower located blocks away.